I learned something interesting about puffins the other day. 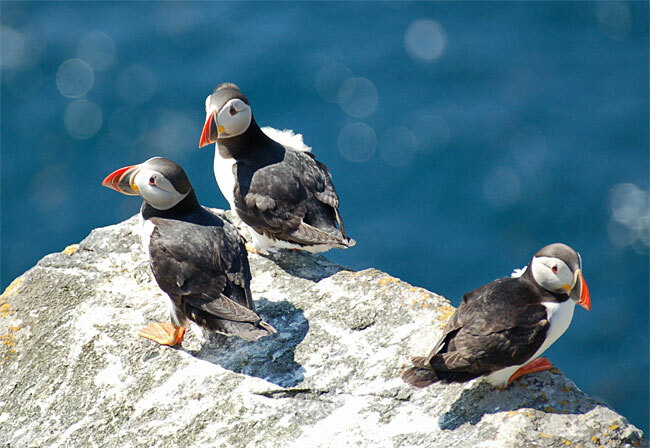 You know, puffins. Cute little birds with faces like French mimes. Apparently, puffins have a gland near the base of their tail that produces a special oil that they coat their feathers with. This oil helps their feathers stay waterproof and it actually helps them float. Without the oil, the water will soak in and they will simply sink. Also the other day, I read a beautiful prayer, a prayer of Jesus. In the Gospel of John, chapter 17, Jesus prays to His Father, and in the middle of it, He says these words, “I do not ask that you take them out of the world, but that you keep them from the evil one.” (John 17:15) Jesus prays that His followers would not be removed from the culture they find themselves in, but that they would be preserved in the midst of it. In a sense, He asks that they would be unstained from the world. Now, there is a common phrase that anyone with much experience in church has probably heard, that as followers of Jesus we are called to be “In the world, but not of the world.” Some take this to mean that though we may be physically present on the planet, we must look and dress different, talk and act different, and in a sense, be so different in the way people perceive us that there is no question we are followers of Christ. Others hold that to be too segregated only serves as a barrier to sharing the love of God, and that we must look how the world looks, talk how they talk and act how they act, so they will be able to “relate” to us, and only our hearts and motives should be different. However, if we look at our lives through the lenses of worship, believing that we are called to set our affection, reflection and devotion on Christ and let our lives be guided by Him, I’m not sure we can afford to live at either of these poles. Consider Jesus. He consistently lived without sin, without selfishness, and without pride. Everywhere He went, people heard Him speaking about the Kingdom of Heaven and the importance of having our sins forgiven and our lives made right with God. People knew He was different, set apart, a holy man. Consider also, that Jesus grew up in a working-class family as the son of a carpenter. During His ministry He was consistently invited to dinners, parties and gatherings of all sorts of people, “saints” and “sinners” alike, and while the “saints” tended to seek Him out in order to spar with Him on religious matters, the “sinners” seemed to just like being around Him as a person. Think about this even, that in His first act of public ministry, Jesus showed up to a wedding feast in Cana (John 2:1-11) and rather than reprimanding the guests for drinking ’till they had used up all the wine, He provided even more. Yet, in all of this, Jesus’ teaching and “God talk” didn’t alienate sinners, but neither did He join with them in loose living (though the Pharisees liked to accuse Him of it). He walked a line between the worlds of the religious and the wanton, the Pharisees and the tax collectors. He was deeply involved and connected with the sea of humanity around Him, but rather than sinking in like everyone else, He floated. How could He do this, remain in the midst of all manner of people and yet be “unstained from the world”? You could easily argue that it was simply a function of His divine nature, but I don’t think that’s it at all. I think the answer is found in the way that all through the Gospels, we see Jesus taking time to consistently and intentionally seek the presence of the Father. Time after time we read how Jesus would “withdraw to lonely places” or “rise up early in the morning” to pray. Prayer was His constant spiritual diet, the food that sustained Him in His 40 day wilderness temptations, the nourishment that strengthened Him from Gethsemane to the cross. He was so covered with the oil of prayer and the presence of the Holy Spirit that no matter the “current” of His circumstances, He never sank. Think also of Peter in his famous “walking on water”. As long as he kept his eyes on Jesus, he defied the laws of nature, but once he lost connection with God, he went down right away. So it is with us. Like a puffin coated in oil need not worry about being pulled beneath the waves, when our lives are saturated with prayer and our eyes are focused on Jesus, the Holy Spirit will keep us afloat, no matter what circumstances we find ourselves in. In this way, we can indeed find ourselves in the world, but not of it; connected, but unstained. This week, may you find yourself drawn more and more into the passionate pursuit of the presence of God, and may the power of His life in you be so strong that living a “life of worship” feels less like fighting against the tide, and more like floating on the sea. Interesting observation. I completely agree that how we treat others is of prime importance. I would ask this though: if “what matters is how we treat other people”, by whose standard do we measure our actions? actually it doesn’t matter what Religion you may have, as long as you treat the other person right.-.. I can definitely see why you would say that Keira, but the question remains. If all that matters is treating the other person “right”, what standard do we use to define what “right” treatment actually is?